In 1979, Elder Paisios moved from the Hermitage of the Honorable Cross to the Panagouda Cell of Koutloumousiou. It was June 3rd, and the Elder, because of the move, had not yet unpacked his liturgical books and did not know exactly the date or the celebrating saint. He performed the services with the prayer rope, and when he began to pray to the Saint of the day, his mind was busy trying to remember who the Saint was. Then in the chapel, two Saints appeared, one in front and another behind. 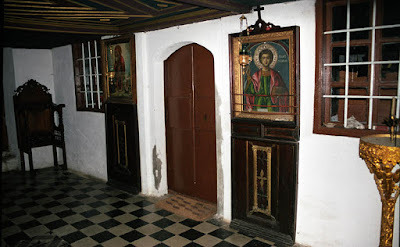 The one behind was St. Panteleimon, whom the Elder recognized and would say that he resembled a lot the icon venerated at the Skete of Saint Panteleimon. The first was unknown however. Because of his bewilderment, the Saint himself responded: “Elder, I am Loukilianos”. The Elder was not paying attention well and asked: “What was that? Loukianos?” “No, Elder. I am Loukilianos.” And immediately the two Saints disappeared. The Elder was moved and found the June Menaion to confirm if St. Loukilianos was celebrating. Indeed it was the day of his commemoration. 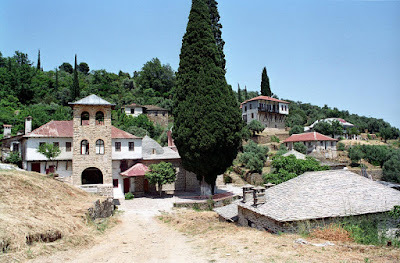 The Skete of Saint Panteleimon belongs to the Holy Monastery of Koutloumousiou, from which it is almost a half hour’s walk away. 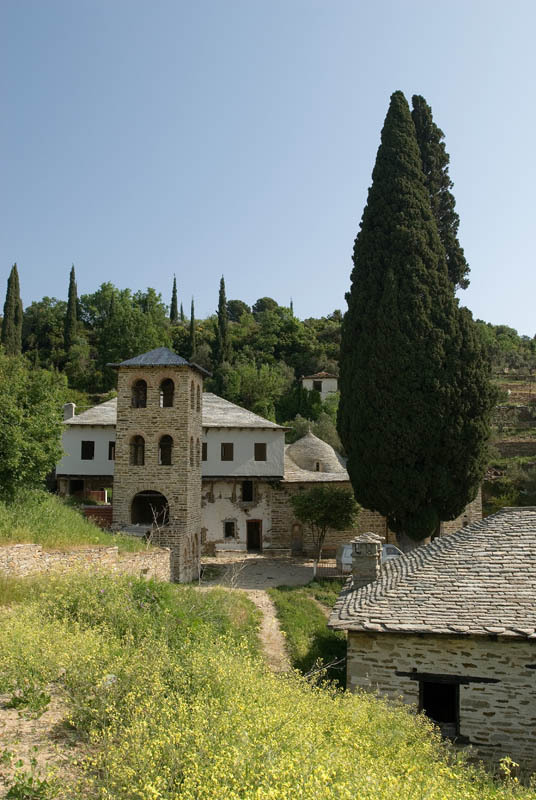 It was founded in 1785 by the Hieromonk Haralambos, on dry and arid land, at the site of an older Cell dedicated also to Saint Panteleimon. 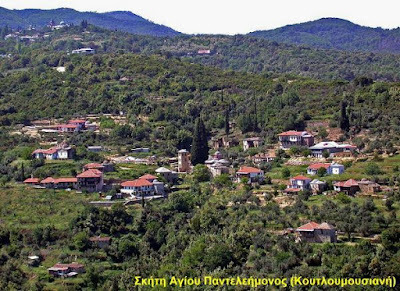 Today the Skete is Greek and idiorrhythmic, consisting of 23 kalyvae arranged as a settlement. The kalyvae are inhabited by twenty monks who are occupied with farming and the products of handiworks. The Kyriakon (main church) was built in 1790 and is dedicated to Saint Panteleimon. It was partly frescoed in 1868. 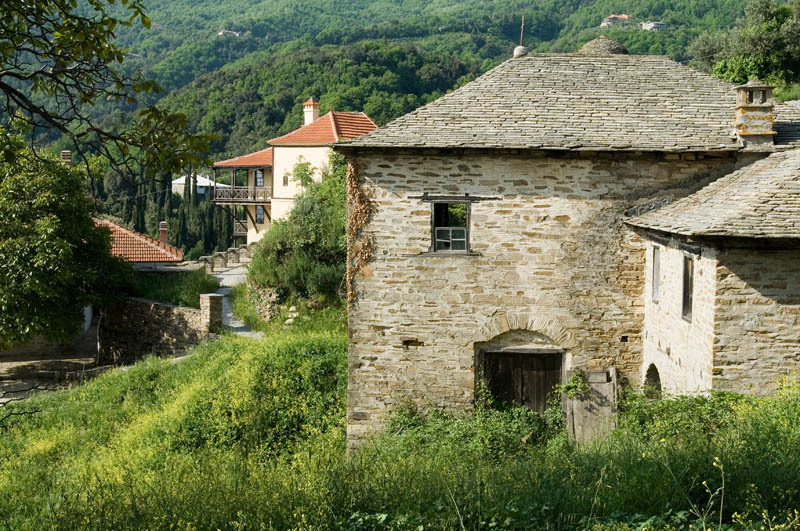 Next to the Kyriakon there is a three story bell tower, a refectory and an archontariki (guest house). Its library contains forty manuscripts and more than 500 books. The Kyriakon of the Skete contains 200 icons and relics of many saints, along with the wonderworking icon of Saint Panteleimon from the 18th century. 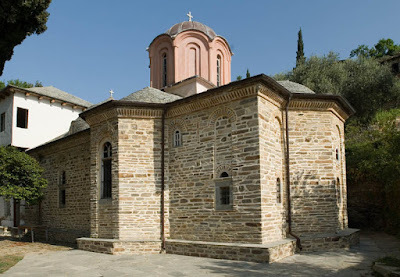 In the Holy Altar is the icon of Panagia of the Salutations (Παναγία των Χαιρετισμών). In the early 19th century the Venerable Martyr Gerasimos the New resided here.